Published by Ishi Press in 1972, this book by Iwamoto Kaoru is very good for people just learning Go (and for refreshing your memory). Part I (ch. 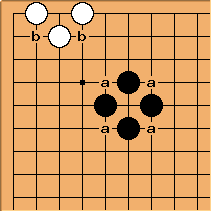 1-3): The Rules Of Go, which includes a 9x9 demonstration game, and explanation of atari, ko, seki, and life and death (especially false eyes). Part II (ch. 4-12): Elementary tactics and strategy. This part of the book will give you a very solid Go education as the author gets into various aspects of the game, including play along the side of the board, ladders , life and death, nets, capturing races, snapback, and so forth. Chapter 9 is Life and Death. Chapter 10 is General Strategy, especially with corner play. Chapter 11 discusses the ranking system. Chapter 12 has two of Mr. Iwamoto's games, against Kitani in 1949 (jigo) and versus Shusai in 1926 (B+Res). There is also an appendix with the rules of Go (as they would have been in 1972), a glossary, and a 1972 list of Go organisations around the world. George Caplan Great book, my first as well. I read David's review, he notes that he has heard there is a hardback edition of the Pantheon version. That is correct. I own one, got in on ebay, sadly, a library discard. Tim Brent: This is a very clear and readable book, which also contains several very good exercises in most sections. I recommend it. "It may help you to understand the difference between real eyes and false eyes if we add this explanation to our examples. In Diag. 62 the four black stones have an eye shape, but the eye will become real only if Black controls three of the four points marked 'a'. The three white stones in Diag. 62 have an eye shape on the side, but to make this a real eye White must control both of the points marked 'b'."